IKEA Place is built on ARCore and lets you virtually place IKEA products in your space. 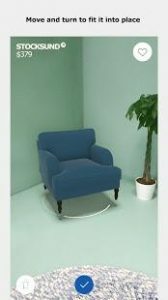 It also has a visual search function: point your camera at any piece of furniture you love and your phone will tell you which IKEA product it is or resembles the most. Select other products and add them to your room to make a new Place. I love this use of ARCore. It’s not perfect, but nothing is. I found it helpful to see what type of furniture ties in best with my flooring. Wish that it worked a bit better with sizing, but other than that it’s really good. Visual search and AR are interesting but could do with being a bit more intuitive. Remember: You NEED ARCore to run this!